Loading an old save file and completing the task should unlock them. Illuminatus and Master Archivist have also been fixed. You need to reload a save file just before you completed them and pick up another tinderbox or note and it should trigger. Thanks for the update, however Quitter and Master Archivist still have not unlocked for me. How many notes are there? Quitter is still broken it seems. I've tested the latest update (A:TDD) and was able to unlock all other achievements except for Master Archivist. Tried it multiple times but it didn't trigger. I loaded one of the last saves, picked up the last note(s) in TDD (also clicked through all the ones previously picked up), finished the story (in different ways), quit the game after the credits and relaunched it to get the last missing notes in Justine (also with different endings). Haven't tried starting a new game yet. Good job on the fixes so far - much appreciated! (12-19-2016, 02:01 PM)Beta Tester N Wrote: I've tested the latest update (A:TDD) and was able to unlock all other achievements except for Master Archivist. Oddly enough it already unlocked when picking up "Last Prisoner Note" in the cells. So basically 3 notes early. Or did the game remember that I picked up the remaining 3 in another playthrough? All I have left here is Quitter and The Heart. Weird that it unlocked after just 3 notes. 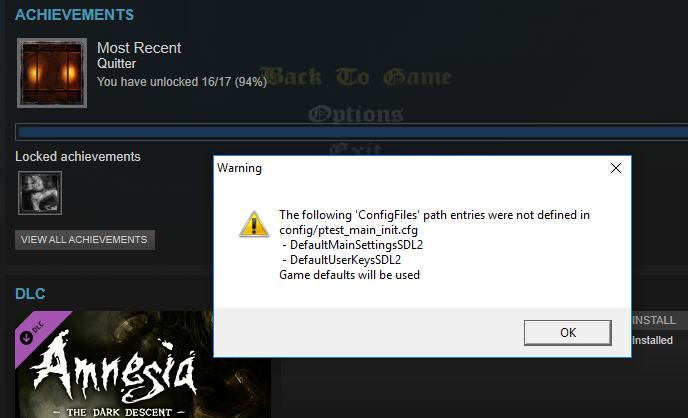 Could you upload your save file and config file I can check what went wrong? There should be 21 notes in TDD and 9 in Justine. You need to collect from both games to unlock it. Quitter should be fixed now. It didnt trigger on some occastions and should always trigger before the credits now. Thanks. I don't have time to test Quitter right now, but I was able to unlock Master Archivist. I didn't realize that diaries do not count towards the achievement, so I picked up the final diary in Inner Sanctum expecting to get it, when the final note is actually in the Cells. So Quitter works now, which reveals that Insanity is also broken. I picked up the last note again, hoping that the game might realize that all other achievements are unlocked but that didn't work. Restarting the game didn't help either. (12-20-2016, 10:39 AM)nebej Wrote: Weird that it unlocked after just 3 notes. Could you upload your save file and config file I can check what went wrong? I meant that the achievement unlocked 3 notes earlier than I expected. But apparently those last 3 "notes" were diary entries which don't count. I somehow assumed that it's required to pick up all the scattered pieces of paper. So nevermind all that. False alert. I tried deleting all configs and saves from Documents but that didn't help. Verifying the game files had no effect either. The game works normal though and keeps all my settings. It never reverts to any defaults. Here are the contents of ptest_main_init.cfg, in case that helps. GameName = "Amnesia - Justine -"
For the latter error, try throwing these two lines in your ptest_main_init.cfg. There should be similar entries in your main_init.cfg file. It's likely just an oversight - if the game still runs, it shouldn't be too much of an issue, but thanks for bringing it up!